Merck Pulls Out Of Agreement To Supply Life-Saving Rotavirus Vaccine To Millions Of Kids : Goats and Soda The pharmaceutical giant will stop delivering its rotavirus vaccine to four West African countries and will begin to sell it in China for likely more than 10 times the cost. A nurse vaccinates a baby against rotavirus, a deadly form of diarrhea. 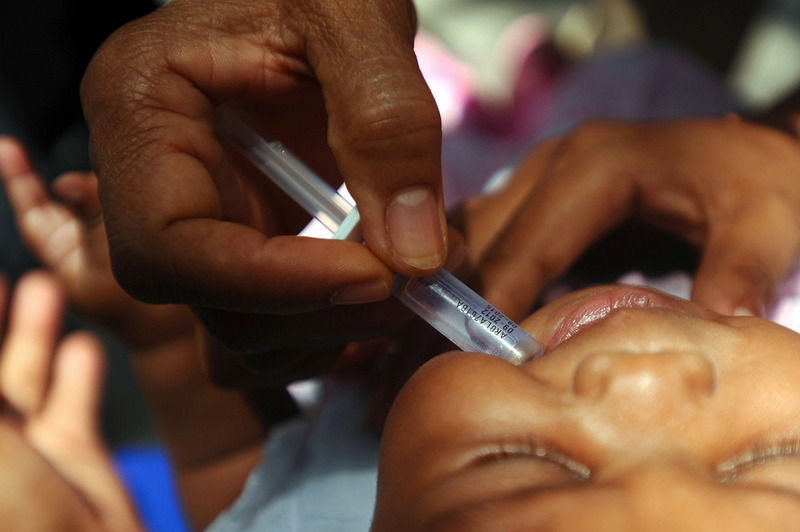 Merck's decision means it will fall short of its commitment to supply its rotavirus vaccine, RotaTeq, to four low-income countries in 2018 and 2019, according to Gavi, the Vaccine Alliance. By 2020, the company will completely stop delivering its vaccine. "This was difficult decision for us, which did not come lightly," Merck wrote to NPR in an email. "We would like to express our deepest regret to all of the parties involved and have offered to assist and work with UNICEF, Gavi and affected countries through the transition to alternative images [versions] of rotavirus vaccines," the email added. Merck said in the email that "supply constraints" were preventing it from fulfilling its agreement to the West African countries. In April, Merck's agent in China received approval to start selling the vaccine there, where the price per dose will likely be more than 10 times the amount Gavi pays for the vaccine for low-income countries. As a result of Merck's decision, more than a half-million children in West Africa may not receive the vaccine in 2018 and 2019, Gavi told NPR in an email. And more than 2 million may go without the vaccination in 2020. "This is deeply disappointing news and in the short term will mean that children are likely to miss out on this lifesaving vaccine, leaving them vulnerable to this horrific disease," Gavi's CEO Dr. Seth Berkley said in a statement to NPR. Almost every child worldwide is exposed to rotavirus by age 5. In rich countries, the infections are rarely lethal but can be severe. Before the U.S. introduced the rotavirus vaccine in 2006, infections caused more than 50,000 hospitalizations each year, the Centers for Disease Control and Prevention says. In poor countries, on the other hand, a rotavirus infection can quickly become life-threatening, says Dr. Mathuram Santosham at Johns Hopkins University. Children can have six to 20 bouts of diarrhea in a day and dehydrate extremely fast. "I've seen kids die right in front of my eyes. It's heartbreaking," Santosham says. "So it's particularly important for the children in the poorest countries — and the poorest children in these countries — to get this vaccine." In 2011, Merck agreed to sell its rotavirus vaccine to low-income countries, via Gavi, for a greatly reduced price — about $3.50 per dose. In the U.S., each dose costs about 20 times that amount, or about $70 per dose. At the same time, GlaxoSmithKline developed a second rotavirus vaccine, Rotarix. The company sells that vaccine to Gavi at a reduced price of $2.25 per dose. For six years, the pharmaceutical companies have stuck to those agreements. GSK has delivered nearly 220 million doses to 42 countries around the world. And Merck has delivered more than 30 million doses to four countries in West Africa — Burkina Faso, Ivory Coast, Mali and Sao Tome and Principe. But then earlier this year, Merck informed UNICEF and Gavi that it would supply the West African countries with only two-thirds of the doses they need for 2018 and 2019. And in 2020, the company would deliver no vaccines to these countries for the foreseeable future, Gavi told NPR. Each year more than 2.2 million babies are born in these countries. Merck told NPR in an email that the shortfall is due to a supply shortage caused by factors such as "country-specific requirements, unanticipated manufacturing issues and packaging challenges that put greater stress on our already strained packaging capacity." At the same time, Merck has started to supply China with the vaccine. In September, the Chinese firm Chongqing Zhifei Biological Products Co. procured about 84,000 doses from Merck and hopes to obtain more than $450 million worth in the next three years, the company said in an announcement. Each dose will likely cost more than 280RMB, or more than $40. When faced with supply constraints, such as this, we evaluate all options to determine how we can fulfill the agreement we made with UNICEF and GAVI-eligible countries to the best of our ability, while at the same time meet the binding contract demands we have with other countries. The product we have allocated to China is what has been approved for use in that country to fulfill the terms of a binding agreement we signed with a local vaccine company in 2012. As I'm sure you can appreciate, the details of that contract is proprietary to Merck; as such, we cannot confirm the number of doses nor discuss price. Breaking into the Chinese vaccine market is difficult for foreign pharmaceutical companies, says Kasey Fu, who directs epidemiology for the analysis firm GlobalData. Most vaccines sold there are manufactured by Chinese companies. And up until last year, the Chinese government required testing the vaccine inside the country before introduction. But once a company gains approval in China, it has the potential to boost sales dramatically, Fu says. "China is a very big market. Just the sheer size of the population of China makes it a very lucrative market," she says. For example, GSK introduced its human papillomavirus vaccine in China last year, and total sales for the vaccine worldwide leaped nearly 60 percent to $185 million. It's unclear how well Merck's rotavirus vaccine will do in the Chinese market, says Christopher Pace, Fu's colleague at GlobalData. Each year, about 17 million babies are born in China. But the vaccine is not required for children, and the cost for a family — which will probably be more than $120 for a full course — may be prohibitive, Pace says. "Merck will have to see what the uptake is like," Pace says. "They may have to consider lowering the cost per dose to get more people to use it." Rotavirus is still a big problem in China. It kills about 3,000 children there each year and, for kids with diarrhea, causes about 30 to 40 percent of hospitalizations and doctors' visits. Right now, there's one other rotavirus vaccine available in China — the Lanzhou lamb rotavirus, or LLR, vaccine — which was developed by the Chinese company Lanzhou Institute of Biological Products Co. Ltd. The vaccine is not required for babies, and coverage has been spotty, ranging from 7 to 30 percent in various districts, a study has found. Evidence suggests LLR is not as effective as Merck's vaccine in China. In large studies, LLR was about 35 percent effective at preventing infections while Merck's RotaTeq was nearly 70 percent effective. "The rotavirus vaccine is needed in every country, whether you're affluent or not affluent," says Santosham at Johns Hopkins University. "So I have no problem with Merck selling the vaccine in China. But kids should not be denied vaccines just because they belong to a poor country." So where does that leave the kids in West Africa? UNICEF, which buys and delivers vaccines to poor countries around the world, says it's trying to help the West African countries switch to another vaccine. "The good news is that for rotavirus, we have other products on the market," says the chief of UNICEF's Vaccine Centre, Heather Deehan. But switching may not be easy — or quick — for these countries. For starters, the alternative vaccine currently used in Africa is the one manufactured by GSK. But the pharmaceutical company does not expect to expand its limited supply to the affected four West African countries in 2018 and 2019 — or to other low-income countries that want to introduce the vaccine, GSK told NPR in an email. Earlier this year, the World Health Organization gave its stamp of approval — or "prequalification" — to two new rotavirus vaccines, which are both manufactured in India: Rotasil manufactured by Serum Institute of India and Rotavac manufactured by Bharat Biotech. Both vaccines are available to Gavi for less than $2 per dose. But it will take at least two years — probably more — for the vaccine to be widely available in West Africa, says Frederick Cassels, who directs the enteric and diarrheal diseases division at the nonprofit PATH, which has helped develop both Indian vaccines. "When WHO prequalifies a vaccine, that's really only the beginning of what can be a long process," Cassels says. "There's this whole regulatory process that has to occur." The new vaccines may be tested in small pilot programs before they're rolled out on a national scale in West Africa, Cassels says. Health care workers have to be retrained on how to administer the new vaccines. Clinics have to be sure they have the ability to store and transport the new vaccine. All these changes take time and money. "India's health care system is ready for this. They've gone through similar exercises with polio vaccines and had a lot of success with that," says Cassels. Still, it will take India a few years before the vaccines are available throughout the country, he says. "It will take even more time in other countries that don't have India's experience," Cassel says, such as ones in West Africa. "Hopefully, the new vaccines will be widely available in less than five years," he says. Even just a delay of a few years would put millions of babies at risk for rotavirus, says Johns Hopkins University's Santosham. "We all as a community should come together and make sure these kids get this vaccine." An earlier version of this story stated that GlaxoSmithKline has supplied 220,000 million doses of the rotavirus vaccine to 42 countries. The correct number is 220 million doses.